The speed at which this arrived was exceptional. I love this canvas art so much. Especially like the depth of the piece with the wrap around canvas. 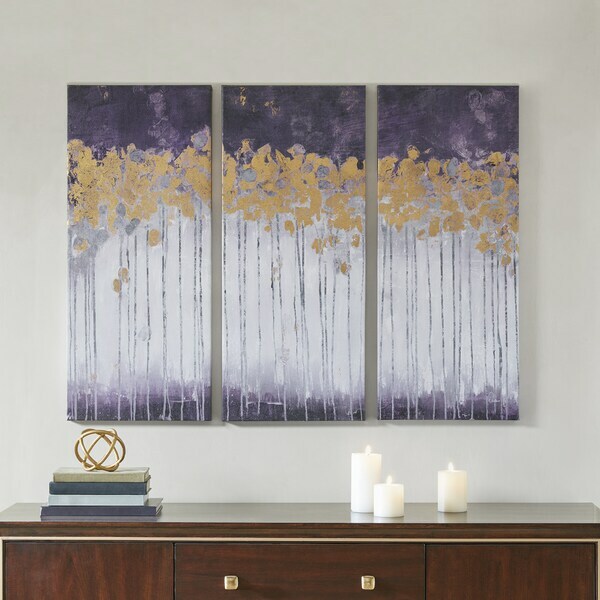 Accent your home with the bold elegance of the Madison Park Midnight Forest Violet Gel Coat Canvas 3 Piece Set. This canvas wall art set features vivid and soft purple hues that create a rich and striking contrast. Hand-painted embellishments add texture and dimension to the abstract artwork, while gold foil accents catch the eye with their elegance. The gel coating creates a glossy sheen that protects the colors from fading and cardboard backings provide additional structure. Hang this three piece canvas set together or separately to create a beautiful modern display in your living room or bedroom. Nice paintings. Loved them! The set comes as described. I put them in the dining room with same color candle sets. The gold color in the canvas matches my dining set. I love these paintings! The colors are beautiful and the shimmer of the gold helps to liven up an otherwise dark wall in my dining room. I thought it would be good that they have clips to hang them from already attached from the frames, but I found them extremely difficult (and frustrating!) to place at an even and level height using the installed hanging hooks. Next time I would do without them! This is a very nice set of three canvas pictures. Then purple color is very vivid. I wish the gold could be silver in the picture . That way it would be softer .This is a very good deal for the price. The canvas was perfect for the living room. The set was well made with no dents or scratches. I absolutely love this set! It is a perfect match for my bedroom - only thing is I'm afraid to hang it up cause it won't be even! Great set of art. 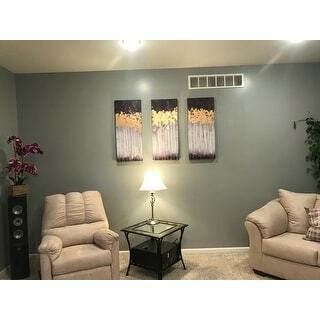 Needed some purple artwork for my basement, something inexpensive and simple but didn't look cheap, and this was the piece. Great buy and does the job. Easy to hang. Just the right shade of purple and large length I was looking for to hang over my couch. The came packaged nicely and when they hang on the way together they look just as pictured.